Following an imperial decree by Ferdinand II, Vienna's second Jewish ghetto was established on 5 August 1625. It was located in the so-called "Unterer Werd" in the Leopoldstadt, north of the Carmelite convent. The settlement resulted in the creation of a "Judenstadt" which soon developed splendidly. 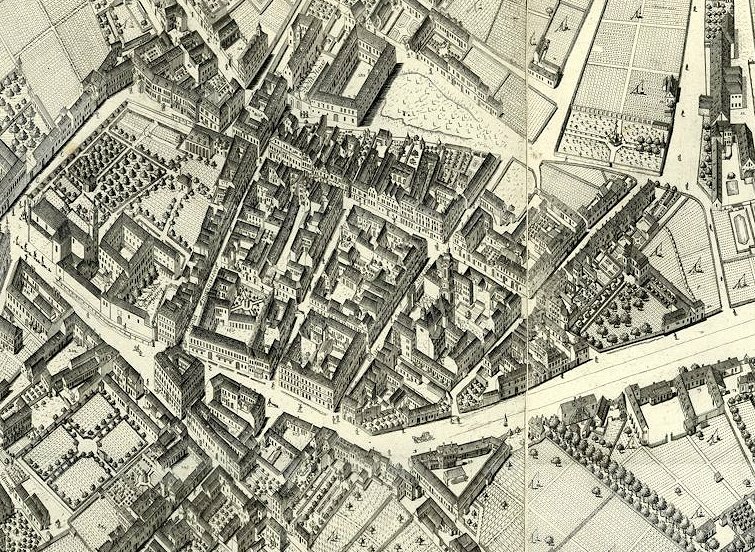 The area of the Jewish ghetto in the Leopoldstadt in 1670 and in 1845 (Ignaz Schwarz: Das Wiener Ghetto. Vienna 1909, and Robert Messner: Die Leopoldstadt im Vormärz. Vienna 1979). 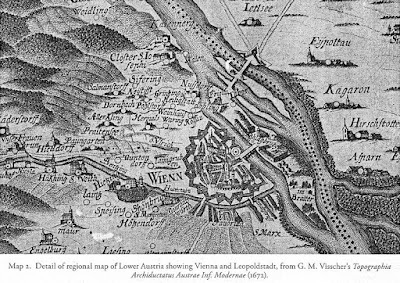 The map on the left from Schwarz's book has been copied many times, although it shows a grossly misplaced Donaukanal. In both illustrations the Carmelite church is at the bottom right. Various circumstances, such as the Jews being falsely accused of having caused the fire at the Hofburg in the night of 13 February 1668, as well as a vow, taken by Margarita Teresa, the bigot wife of Leopold I, caused the Emperor to comply with the decision of the Vienna City Council, to expel the Jews and have the ghetto closed. In July 1669 the first, in August 1669 the second order of expulsion was decreed. More than 1,600 individuals had to leave the city, only a small number of wealthy and influential Jews remained who tried everything possible to make the Emperor reconsider his decision. By 26 July 1670 the ghetto had to be completely evacuated and, as of August 1670, all Jews had left Vienna. Their houses were sold at a loss of 52,858 gulden. St. Leopold's Church was built on the foundation of the new synagogue and consecrated on 18 August 1670 in the presence of the whole court and all ambassadors. In 1675 the remains of the old synagogue were used to build St. Margareth's Church. Only one cultural site could be preserved: for a sum of 4,000 gulden the City of Vienna agreed to take care of the Jewish Cemetery in the Roßau. Although the expulsion of the Jewish community had disastrous long-term consequences for Vienna's economy, the court chamber was unable to convince the Emperor of the necessity to have the Jews return to Vienna. Leopold stuck to his conviction that this issue had to be considered "first theologically, then politically, and only last economically". The negotiations were not successful, the return of the Jews in huge numbers and a re-establishment of a Jewish community never came to be. Only individual permits were granted. In later times the Leopoldstadt became the favorite area of Jewish residents, but there never was another Jewish ghetto in Vienna. 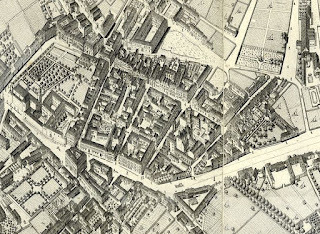 The former area of the Jewish ghetto in the Leopoldstadt on Joseph Daniel von Huber's 1778 map of Vienna. On the left is the Carmelite church of St. Joseph, on the right the church of St. Leopold which was built in 1670 on the site of the synagogue. 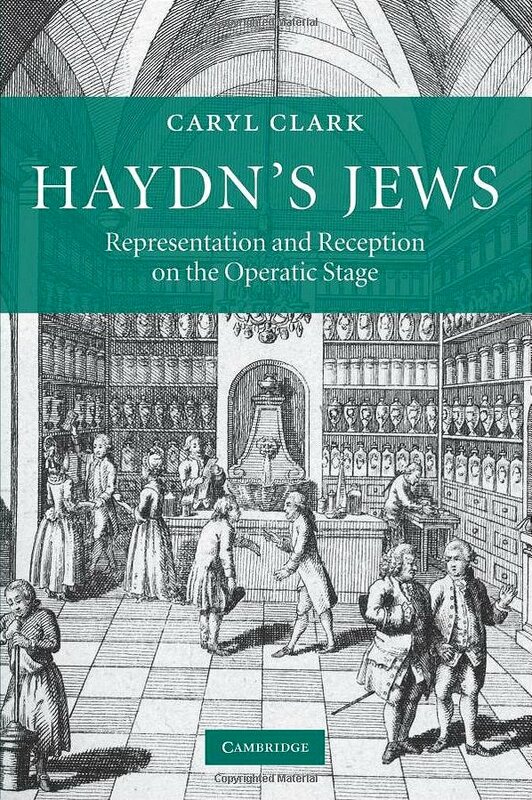 In 2009 the Canadian musicologist Caryl Clark published a monograph, titled Haydn's Jews: Representation and Reception on the Operatic Stage. In this book Clark presented several interesting ideas concerning some of Haydn's musical works and the Jewish communities in the composer's immediate environment. The book's central hypothesis is that the title character of Haydn's opera Lo Speziale (The Apothecary), composed in 1768 to a libretto by Carlo Goldoni and first performed at Eszterháza, is an encoded representation of the typical “stage Jew” of the time, and would have been recognized as a Jew by contemporary audiences. Devoting a long chapter of the book to Haydn's masses, Clark also tries to show that Haydn composed the Missa brevis Sancti Joannis de Deo (written ca. 1773-76) for the Barmherzige Brüder (the Brothers Hospitallers of St. John of God), who were interested in converting Jews as part of their mission. Clark tries to support this theory on the basis of the omission of a line from the Credo, "Et in unum Dominum Jesum Christum" which she suggests was omitted to make the Mass more acceptable to Jews in the process of conversion. This secenario appears even less tenable considering the fact that in 1670 not a single Viennese Jew had converted to escape expulsion. Haydn had ample opportunity to observe Jews in his working environments in both Vienna and Eisenstadt. By the time he was involved in the revival of Der (neue) krumme Teufel with Kurz-Bernardon in Vienna he was already frequenting the church of the Barmherzige Brüder – the Brothers of Mercy – in the nearby suburb known as the Leopoldstadt, where he was an occasional employee. Located just outside the walled city across the canal, the Leopoldstadt was also the home of Vienna's Jewish ghetto. [...] Directly across from the hospice along the west side of Taborstrasse, the main thoroughfare linking the Leopoldstadt to the canal bridge (the Schlagbrücke – today's Schwedenbrücke) was the Judenstadt, or Jewish ghetto (Map 2). "Map 2", which is referred to at this point, is the rough map of Vienna in Georg Matthäus Vischer's 1672 Topographia archiducatus Austriæ Inferioris modernæ. It shows the Schlagbrücke across the Donaukanal, but not the Jewish ghetto. Vienna on Georg Matthäus Vischer's Topographia archiducatus Austriæ Inferioris modernæ in Clark's book Haydn's Jews. Note the three[!] mistakes in the caption (Clark 2009, p. 52). 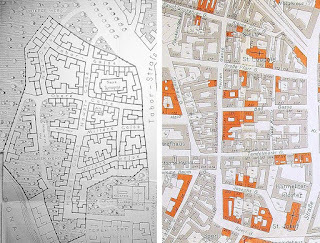 Similarly isolated and isolating was the Viennese ghetto. Called 'Unterer Werth' (Below truth[sic]), it was founded across the Danube River from the northern gates of the walled city in 1624. 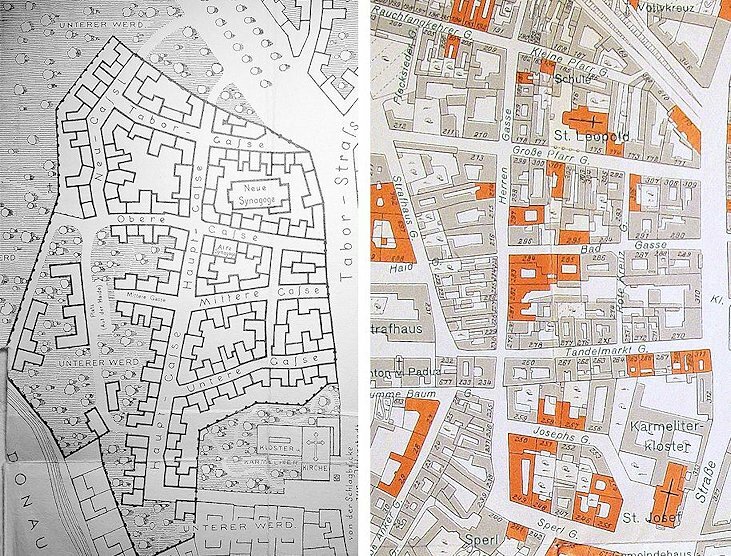 Despite the constant threat of flooding, and a high child mortality rate, this small Jewish settlement flourished, growing to encompass 132 houses in 1670. That same year Emperor Leopold I acquiesced to various pressures, including that of his Spanish consort, who blamed the Jews for the miscarriage she had recently suffered, and ordered their expulsion. Long stigmatized as 'godless, dishonorable, filthy, and uncultured', Jews were now labelled 'enemies of Jesus' for having failed to change their ways (i.e. convert) and, for the second time in their history, they were expelled from their city. [...] So despite the warnings of several advisers, but at the urging of many Viennese merchants, the Judenstadt was destroyed and the synagogue torn down and replaced by a Catholic church, the Karmeliter-Kirche[sic]. Clark refers to Ignaz Schwarz's book Das Wiener Ghetto (Vienna 1909), but she seems to have had some problems understanding certain parts of this book. Her translation of "Unterer Werth" as "Below truth" is utterly mystifying. The German word "Werth" (also "Wörth" and "Werd") means island. Thus the term "Unterer Werth" refers to the southern island (the Leopoldstadt) in opposition to the "Oberer Werth" (the Rossau). The synagogue was not replaced by the Karmeliterkirche (which had been built decades earlier), but by St. Leopold's Church. Clark's book received a number of positive reviews, but the two only real experts among the reviewers, Jeanne Swack and Bruce Alan Brown, more or less thrashed it unmercifully. In her review in Musica Judaica Online Reviews Swack described most of Clark's forced arguments as untenable. Swack pointed out that in eighteenth-century opera there simply are no secretly-encoded Jews and that the authors at that time went out of their way to make sure the audience knew the character is Jewish. The characterisation of these figures is generally so unambiguous that Haydn's "veiled Jews" are not awaiting a twenty-first-century unmasking. Concerning the concept of "conversion masses with missing lines" (which is a very laboured concept to begin with, because the attendance of Jews at a performance of a mass is never proved) Swack argued that the line "Et in unum Dominum Jesum Christum", which is also missing from the Credos of three other Haydn masses, including the late Theresienmesse, is hardly the only line in the Mass ordinary that Jews would find objectionable. In his review in the Journal for Eighteenth-Century Studies Bruce Brown was very polite, but unforgivingly pointed out all of the book's flawed arguments, factual mistakes and funny translation mishaps. Brown addressed the basic incompatibility of Clark's ideas that "converts were attracted to the incomprehensible 'Mauscheln'-like polytextuality of the Credo, yet also somehow could tell that Haydn had omitted a crucial article of belief in its text". Brown concluded his review as follows: "However well-intentioned this book's author may be, it is distressing that she does not let the evidence lead where it may, but instead feels compelled to twist the reader's arm at nearly every turn." Soon after the publication of her book Caryl Clark wrote an article, titled "Encountering 'Others' in Haydn's Lo Speziale (1768)" whose proposition is based on the same core argument as her book: the characterisation of Sempronio in Haydn's Lo Speziale as a Jew, a "judaized apothecary", who is "of even lower stature than the Muslim" and "marginalized even more than the Gypsy". 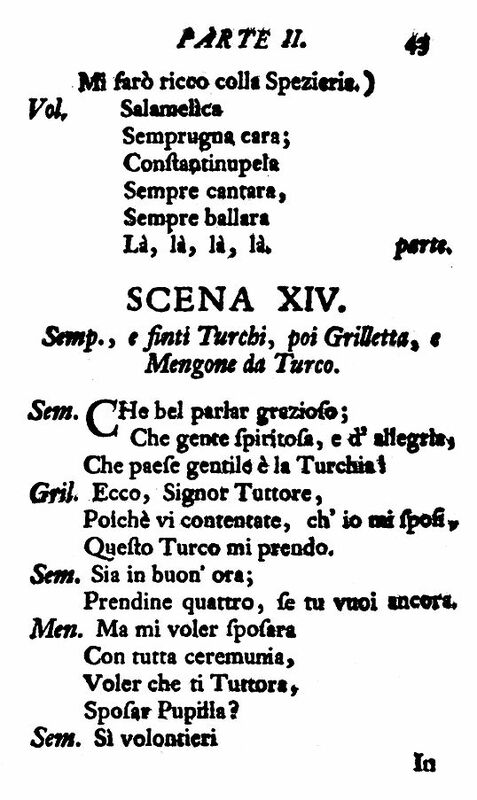 To add to this premise, even Volpino, appearing in Turkish disguise in the thirteenth scene of the opera, is cast into the light of "veiled Jewishness": the "dadl dadl" in his aria "Salamelìca Semprugna cara" is declared by Clark to bear a resemblance to Hasidic nigun. 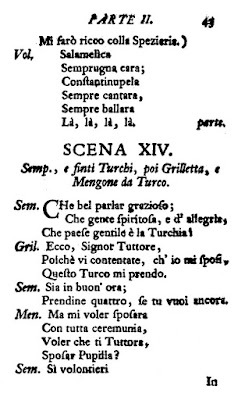 In Goldoni's original libretto the line in question consists of a simple "Là, là, là, là". To demonstrate that "the Jews lived in their ghetto, directly across the street from where the Barmherzige Brüder lived", this passage in Clark's article is followed by a footnote referring to (what else?) 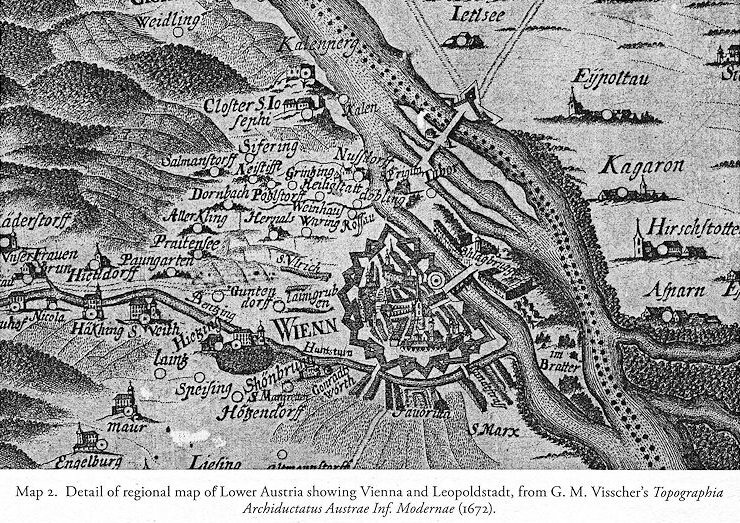 the Vischer map of Vienna on p. 52 of Clark's book. As can be seen above, as far as the location of Vienna's Jewish ghetto is concerned, this map has absolutely no documentary value. In 2014 Clark's article was published by the Hollitzer-Wissenschaftsverlag in volume II of the multi-part series Ottoman Empire and European Theatre. This book (which contains a number of other stunning oddities that shall remain unnamed here) is a collection of contributions to the symposium The Time of Joseph Haydn (1732-1809) From Sultan Mahmud I to Mahmud II (r.1730-1839) which was organized by the Don Juan Archiv and took place in 2009 in Vienna and Istanbul. Where on earth could such a jumble be published that presents Italians and Turks as "veiled Jews" and resurrects a ghetto in 1768 that was already closed in 1670? In Vienna of course, where this ghetto was located and where editors of lavishly produced books appear to be rather poorly informed about the history of their own city. In the course of more than three years I published 78 "posts" on this blog. The time and work I invested into these publications, which are based on top quality original research, equal an investment of about 75,000 Euros (84,650 USD). Because I lack the time and means to further pursue this very expensive hobby, I cordially invite everybody who is interested in the continuation of this enterprise – which is not a blog, but a scholarly journal – to make a donation to support this blog. Any amount, be it ever so small, will be gratefully accepted.